The day started with a delay, but in true CWB style the team soon rallied to a game of kwik cricket across three spaces in the hotel car park with Eddie, our driver, as a reliable umpire! When we got to our first school, GS Gitarama, we were greeted with a Bibical reference to Romans 10:9 on one of the teachers tee shirts, that set the tone of the school. 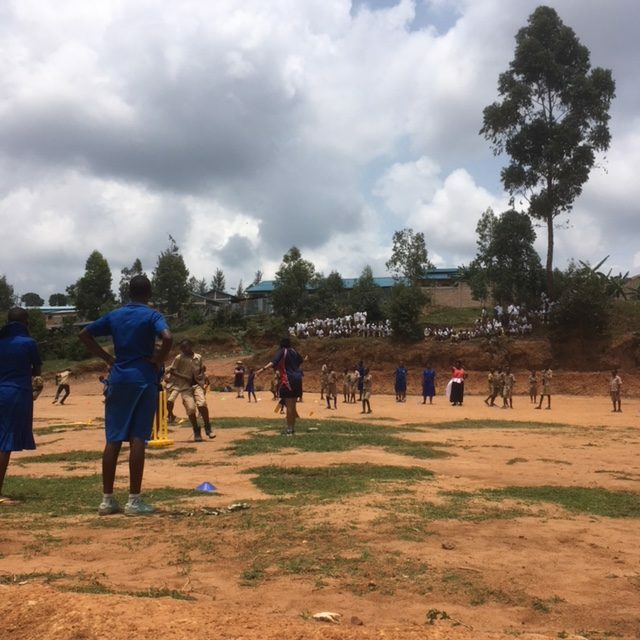 Once we had descended approximately 200 metres down a rocky slope to a flat playing area we coached 400 students, primary and secondary, in drill stations and finished with games of Rapid Fire! 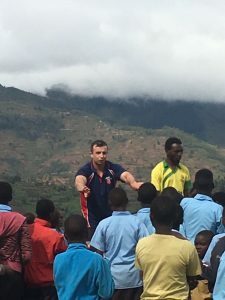 Pete Lamb departed on public transport to Kigali, to assist Lee in the further coaching development of RCA Development Officers, we departed for our afternoon session. We drove for over an hour to Kirwa School. The tired and the wise amongst us questioned the planning of such a rural venture, in the development of Rwandan Cricket and discussed, with vivid descriptions of how it could have been planned and organised more efficiently. However, when we finally arrived ‘it was all worth it’ As L’Oreil says! We had the whole school to coach, over 500 kids; really receptive and keen to learn! All this perched on a hill side, with the poetry of the Rwandan landscape all around! The only mishap? A large arthropod flying into Thom’s eye, expertly removed by Ryan and Jackson with a blade of grass with 80+ children looking on! The undoubted highlight of the day was Livingston; a teacher from the morning school who without coach ed picked up our methodology and ran with it. He was brilliant. He then accompanied us to the afternoon venue to learn more and will accompany us on Friday to learn more again. A fine example of truly sustainable coaching!